Welcome to my new blog “Rants From a Self Help Junkie!! !” My purpose in this was to find an outlet to let all the creative energy, all the ramblings in my mind, all the crap that I didn’t know how to let escape… OUT!!! For the longest time I felt like I had something to say, and just no way to say it. Now Pandora’s box has been opened. So what exactly do I have to say? 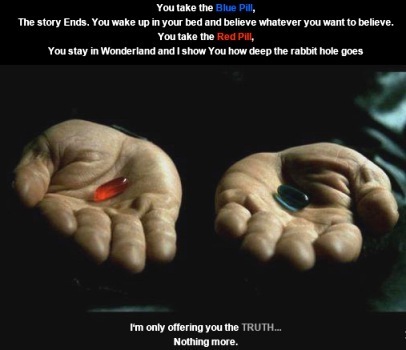 Why do I hope you’ll take the red pill and follow me down this rabbit’s hole? Well it’s kind of hard to describe. As the title indicates, I’m a self-confessed “Self Help” junkie. Over many, many years I’ve bought into the hype, I’ve splurged on the products, I’ve followed the gurus, looking for that magic formula… that secret idea on how to make my life better than it is. I’ve always envisioned for myself wanting to be the self-made wealthy guy, the fitness role model, the adventurous person that people would want to emulate and follow. So far, the truth has been a little less glamorous! I’ve lived some adventures, seen some of the world, made something of myself, but have still felt… unfulfilled. It’s my intention to use this blog as a stepping stone, a jumping off point to something bigger and better. I intend to share what’s rolling around inside my head. Things I’ve learned, things I’ve seen and experienced, the good times and bad. I’m hoping by sharing with you, the reader, I’ll find a purpose, I’ll find some direction and growth to something better. I hope we’ll have some laughs too and will all be better off. I guess that’s about it for now. So welcome to my world and I hope you enjoy the ride! This entry was posted in General and tagged Adventure. Bookmark the permalink. Good work Tom, I hope that I can find some inspiration to keep me going 🙂 I too really liked Invictus, it even had a good sound track. Keep writing, it’s good for the soul or so they say… anyway, I enjoy the read.